According to general relativity the direction of light is affected when it passes sufficiently close to a large mass. In fact, this is not as strange as it may first appear. It is not the light that is affected but rather the space-time. This means that our ordinary coordinate system with perpendicular axes is not sufficient to describe space-time. Therefore, we will think that the light has been bent. Examples of objects that are sufficiently massive to do this are stars and clusters of galaxies. But there are also indications for more exotic objects such as MACHOs (MAssive Compact Halo Objects) or WIMPs (Weakly Interacting Massive Particles). Independently of which type of massive objects that one is looking for there is only one method, namely to study the light from luminous objects behind the massive ones. The blue images of galaxies in this photo from the Hubble space telescope are actually all of the same galaxy. 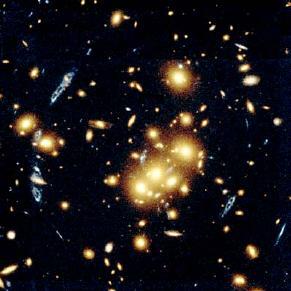 This phenomenon appears because of gravitational lensing from the Cl0024+1654 cluster. What is then the effect on the light? As the title suggests the mass one wants to study works as a lens which bends the light that passes the object. This has the effect that one sees light that one would otherwise not see and that the light appears to be amplified. Another effect that is common when one studies objects behind clusters of galaxies is that one sees several images of the same object. Sketch showing how the light from the source (yellow) is bent when it passes a massive object (brown) and then is observed on earth (blue-grey).